Conversation With David Goff About His New Book. 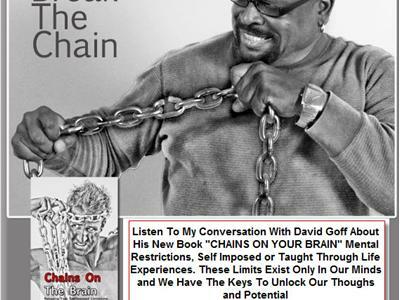 David Goff is an artist, author, teacher and creator of the Chains On the Brain Concept. His message is one of mental freedom from the chains that are self imposed limitations. Chains symbolize any thought process or belief that limits our ability to connect to our full potential. Ultimate joy and freedom are experienced when we recognize our chains and understand our ability to take them off.